The Hirondelle Biodiversity Reserve is located in the administrative region of Nord-du-Québec, between 52°50’36’’ and 53°01’08’’ latitude north and 71°29’15’’ and 71°53’17’’ longitude west. 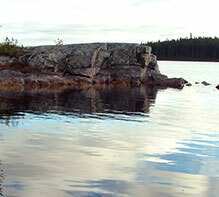 It is located approximately 300 km northeast of the Cree village of Mistissini. The proposed biodiversity reserve covers an area of 322.0 km².